Zdenek & Christie are the core duo of producer/arranger, bass player, composer Zdenek Kansky, and his wife vocalist, pianist, producer and composer Christie Kanska. Together with a host of musicians and guests, they offer a modern concoction of Jazz, Latin, Fusion, World music, Funk and off-kilter broken beats, shifting, twisting rhythms, and adventurous electronic explorations. Christie Kanska is happy to announce the release of her latest studio album called Le Reve -The Dream. As the producer of this album she wanted to create a fresh sound of Latin Jazz with a fusion and mixed style feel to capture the positive spirit and story behind each song. Le Reve - The Dream features 11 tracks. Track- the “Le Reve”, is an original instrumental composition by Christie Kanska. The other songs are 7 well-known bossa nova standards by some of the best-known Brazilian singer-songwriters. They include Bananeira by Joao Donato and the classic songs by Carlos Jobim which include: Dindi, Triste, Fotografia , No More Blues, One Note Samba and the iconic Girl From Ipanema. All tunes were arranged by Zdenek. The album also includes a swing song by Cole Porter: “From this moment on” in a Brazilian baiao rhythm. This album also includes an Upright bass Inspiration - composition by her husband , co producer and arranger Zdenek Kansky from which the Latin jazz theme for the album originated. “For Christie” by Zdenek Kansky is an enchanting melody highlighting some of the that wonderful contemporary jazz music, filled with so much space and infinity that it makes you embrace the unembraceable. It is magical with the dreamy sound of string pads with smooth chord progressions and open voicings. “Le Reve” offers that modern modal concept integrating electric and acoustic sounds. It is a mix of modern rock-fusion style with the smooth classic Bossa Nova sounds to convey the power and speed of our busy lives juxtaposed with the nostalgia and softness of more lay back times. The CD Album features Christie Kanska - on vocals, keys, Zdenek Kansky on electric and an acoustic bass, Matt Savage on piano and keyboard, Ethan Kaczowka on acoustic guitar, Javier Rosario on electric guitar and Brazilian drummer Alberto Netto. Christie’s & Zdenek’s music collaboration began when the two scholarship earning Europeans, one from Greece and the other from The Czech Republic, met at the esteemed Berklee College of Music in 2001. Their meeting was a fusion of performer composers which produced one of their signature smooth jazz songs, My heart is longing for you., with Zdenek writing the music and Christie the lyrics. The two musicians fell in love and married after graduation in 2005. Since then their relationship has been a fusion of growing musically and spiritually. In addition to being the ZCK Production duo, the pair formed a band “World Jazz Ensemble” touring Europe with musicians from the US, Austria, Czech Republic and Mexico. Upon their return to Boston in 2010 they continued playing together and seeking musicians to share their music concept. Their current project name is the ZCK Jazz Quartet. Zdenek’s passion is a Jazz, Latin Fusion styles, while Christie loves to integrate Jazz, Classical and Folk music connecting to her Greek and Armenian heritage. Their musical romance is a tasteful blend of different styles of music. 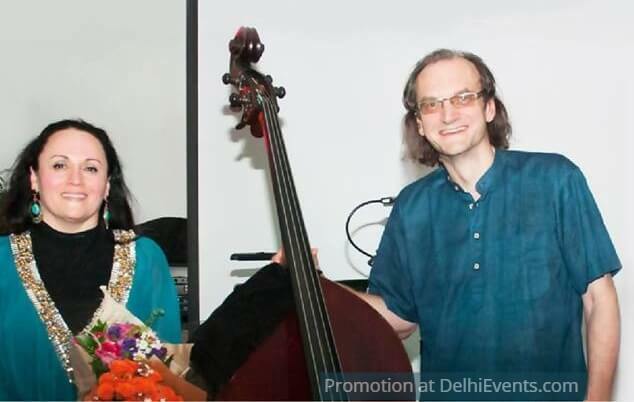 In recent years, Zdenek & Christie have developed an appreciation for Indian classical music. They were fortunate enough to be invited to teach at top contemporary music colleges in Chennai, India as well as to perform at some of India’s premiere jazz clubs and festivals. The musician’s tone is the expression of one’s soul, feel and musical tastes. To find that just-right sound, Zdenek, uses varying 2-4 finger and slap muting techniques on his 6 string Fodera and Neuser custom built basses. On the upright bass he prefers using a bow and exploring the percussive quality of his instrument. For Christie, her specialty is finding new colors of her voice to create a custom fit for each unique song. The couple see the future of the development of music as a tasteful combination of varied styles of music and influences. They encourage each creative artist to learn some traditions of different styles of music and then add something original from their own personal taste. At present, Zdenek & Christie are energized by the upcoming opportunity to tour all around the word and share their inspiring music from the new album Le Reve - The Dream.